If you think the freshman 15 is real, loosen your pants and prepare yourself for the weight you’re about to take on in Taiwan. Leave your tight fitting jeans at home, burn your belts, because things about to get REAL TASTY. On any given city block in Taiwan, you’ll find an onslaught of delicious treats, mostly to-go. When nighttime hits, night markets become new neighborhoods with thousands of people flocking to indulge on arguably the best street food in the world. In my three weeks in Taiwan, I travelled north to south in search of the best foods this country has to offer. Armed with an insatiable appetite and a pack of antacids, I documented every street food I ate and chose the best of the best for this guide. In the details I list where I specifically ate each food, but almost every food is available at every night market, or at small shops on the street – unless otherwise specified. Of the 40+ countries I have travelled to, I honestly believe Taiwan has the best food I have ever eaten. Grab a friend (you’ll need someone to split everything with), book your flight, and maybe sign up for a few spin classes on your return, K? TIP: Bookmark or save this guide! Night markets can be overwhelming with very few English translations, so it will be really handy to have a copy of this on hand. Stinky doesn’t really do this food justice… it WREAKS. It’s quite possibly one of the worst smells in existence, like something died and was left to rot in a pile of s**t. That said, it’s a tasty tray of umami goodness topped with a sweet sauce, and you need to try it when in Taiwan! Where I ate it: Feng Chia Night Market, Taichung. Available at all night markets. Sausage inception? It exists in Taiwan! First they stuff a sausage casing with rice and grill it. They slice it open to form a “bun,” then line the inside with cucumber, crushed peanuts, sweet and spicy sauces, and pickles. Then they top it with another sausage, and bundle it up nicely in paper so you don’t spill. How do you tell a good shop from an average one? Make sure it includes cucumber! Classic comfort food. In Taiwan it consists of noodles served with chunks of beef – and if you’re daring, cartilage and tripe (highly recommended for those texture-lovers). Great for soothing your soul on a rainy day (which in Taipei are extremely common). Where I ate it: I tested this category thoroughly (hard job, I know), and went to three of the most famous noodle establishments in Taipei to compare. Overall, my favorite is Lao Shandong Homemade Noodles. They have a Bib Gourmand award from the Michelin Guide (same people who do Michelin Star), and their hand-pulled, homemade noodles are perfection. The meat is OK, and the price is just right at approx. $5 USD per bowl. Yongkang Beef Noodles serves a really tasty bowl of the spicy variety and their meat is the most generous and tender — however the price is outrageous at almost $8 USD. For a satisfying no-frills bowl that’s only 90 NTD ($3 USD), head to Fuhong Beef Noodles. Lao Shandong Homemade Noodles, Taipei. Until I learned that these are called pepper buns (read: 10 seconds ago), I used to call these “pork buns baked on side of oven wall”. It’s just that: a pork bun stuck to the inside of a hot oven wall and baked until the bottom is crispy. Where I ate it: 福州世祖胡椒餅 士林店 at Shilin Night Market in Taipei serves a great bun (copy/paste the name into Google and it should come up). There is also a famous place to eat these buns at the entry of Rahoe Night Market, but the line is permanently insanely long, so I never got to try them. Another one for the mochi lovers, these are steamed glutinous rice dumplings filled with sweet and savory fillings. The mochi is a deep green color as it contains mugwort (doesn’t really add any flavor). My favorite is the savory salted radish, which when combined with the slightly sweet mochi is a delicious contrasting combo. Where I ate it: I have only seen these at Ah Lan Hakka Glutinous Rice Cakes in Jiufen. I can hear my white friends squirming as they read this. It’s exactly what it sounds like: fish skin or fish balls (a very processed meatball made of fish), served in a clear broth. If you don’t mind “fishy” taste, you will love this. My mum is Chinese and I used to eat fish soups like this all the time — it’s kind of like an Asian-person’s version of chicken soup. Where I ate it: The only place I have seen this is at Wang Shi Fish Skin in Tainan, where it is their specialty and they serve it for breakfast. It was honestly one of my favorite meals I ate in Taiwan! Sausage is big business in this small island country. I’ve seen a couple of signs that say it’s made of wild boar, but I think that may be a stretch. Nonetheless, this night market staple is great, and much sweeter than sausages you may be used to. Where I ate it: It’s available all over the country, and it tastes pretty much the same everywhere. Flakey, golden, pan-fried dough layered with green onions. You can also get it with eggs or other tasty toppings. Where I ate it: Although they are everywhere, I really like the ones at Tian Jin Onion Pancake in Taipei (I mean, look at how seriously this guy is taking his pancake!). Corn on the cob: An old classic that the Taiwanese put a fantastic, spicy, garlicy spin on. It’s grilled over fire, which caramelizes the sugar in the seasoning. Where I ate it: Ningxia Night Market, Taipei. Available at all night markets. Vegetarians fear not – Taiwan has a great selection of mushroom dishes. One of the most common dishes at night markets is grilled King Mushrooms, braised with a sweet soy sauce. You can also get various other types of mushrooms deep-fried (I like shiitake best). Where I ate it: For the King Mushrooms, head to Ningxia Night Market where the quality is highest (due to fast turnover). Available at all night markets. I tried to find the official name for this one, but came up empty – sorry! But I can assure you this tasty treat is worth seeking out. It’s a mix of vermicelli noodles, cabbage, and shiitake mushrooms rolled up in a thin dough ball, deep-fried. Where I ate it: The only place I saw it was at 日月潭年記香菇包 (rìyuètán nián jì xiānggū bāo) in Ita Thao, a small town on Sun Moon Lake. If you’re visiting SML, this village will definitely be on your itinerary. If you think you’re looking at a red alien incased in some sort of life-preserving jelly that it needs to survive – you’re wrong… they’re dumplings! It’s essentially pork that tastes like char sui (Chinese barbeque), wrapped in something like mochi, and deep-fried. Where I ate it: I have only seen these in Jiufen; I ate mine at Jinzhi. Did you know that Taiwan invented bubble tea?! You can have all the boba to your hearts content here, and pay about $1 USD per serving. If you’re looking for something different, try grass jelly – I prefer this instead of bubbles. As for tea, my go-to is Roasted Oolong, no milk. If you’re drinking often, remember to bring your own cup and straw – they will give you a discount if you do! Where I ate it: The tastiest bubble teas I had were from Wanpo Tea Shop (Taipei) and Bit To Go (Tainan). Chain stores 50 Lan, Ten Ren’s, and Coco also serve up decent boba, and you’re never more than five minutes walk from one. Not for those who can’t deal with “texture foods,” mochi are chewy balls of goodness. In Taiwan you can eat it in a bunch of different forms, but the main ones are boiled and served with black sesame and/or peanuts, or in a sweet soup. Some shops also sell them with fun fillings, like more black sesame, peanuts, and red beans. Where I ate it: You absolutely have to get mochi at Buloa Hakka Traditional Mochi in Taipei, where they fill it with unique fillings like coconut cream. There is also a great stall at Ningxia Night Market that serves freshly boiled mochi with a side of sesame and peanut. 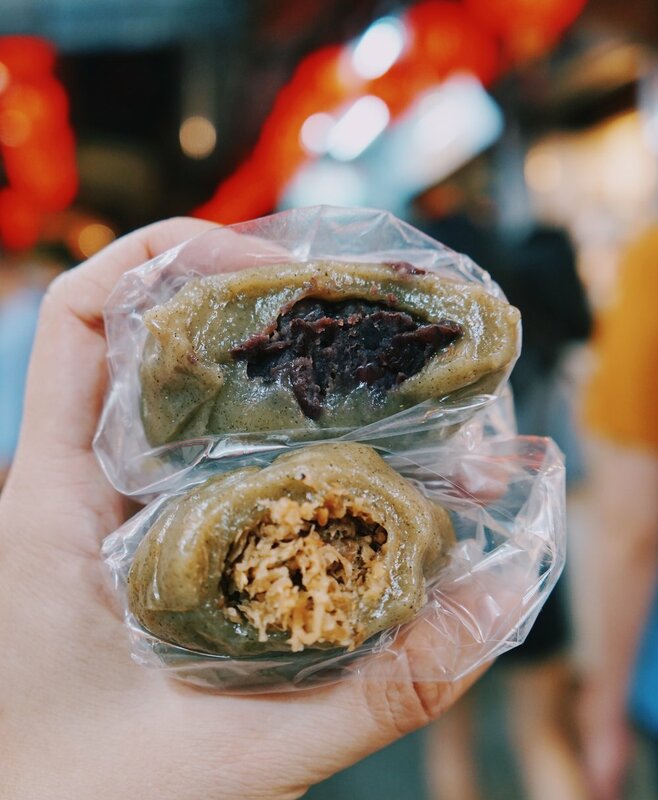 Buloa Hakka Traditional Mochi filled balls (flavors: peanut, black sesame, coconut, red bean), Taipei. One of my favorite foods I tried in Taiwan! They make little dough balls out of taro, boil them, then serve them hot or cold (over ice) with a scoop of sweet beans. Some of the taro balls are mixed with other flavors, like sweet potato, black sesame, and matcha. The texture is phenomenal – similar to mochi, but less sticky. Where I ate it: While it can be found all over Taiwan, the best place to try it is in Jiufen (also known as the town that inspired Spirited Away). I tried multiple stores in town and I liked Ah Gan Taro Balls the most – these have a chewy but firm texture, and there is a stunning view to the ocean from the balcony. If you like jelly (or “jello” as my U.S. friends call it) then this one is for you. It’s a jelly made out of soybeans, served in sweet sugar syrup. You also have the option to add other toppings, like red beans, taro balls, or tapioca pearls (boba). The smooth tofu is heaven in your mouth, literally melting on contact. Where I ate it: 同記安平豆花 (also known as Anping Bean Jelly) is located in the Anping district of Tainan. It is a 10 minute walk from the main attractions of Anping, but it’s worth it for a phenomenal bowl topped with red beans. For a non-soy alternative, try the almond version at Yu’s Almond Dessert in Taipei. A night market staple, these are chewy dough balls made with sweet potato, deep-fried so they have a nice crispy outside. Really simple, and the perfect snack to share with friends (one bag is a lot to handle alone…). A little hot pocket pancake, filled with sweet red beans! The other popular flavor is custard, and you can sometimes find savory fillings like cheese, corn, and ham. Where I ate it: You can find these at street carts all over the country, and at all night markets. Taiwanese bakeries are the real deal: ultra-refined white flour, baked with as much sugar as legal, and crafted into beautiful works of pastry art. If you’re looking for whole-grain, please look elsewhere because the items at here are strictly indulgent with both sweet and savory options. Choose with your eyes! Where I ate it: My favorite bakery is a chain called Ijysheng; they have locations all over Taipei. A bakery classic and fail-safe option: egg custard tarts. I’m still not really sure what this is, but I’ll do my best to describe: imagine solid custard, cut into cubes, threaded onto a skewer, battered, and deep-fried. The result would be something along the lines of “frying milk”. Once it has been fried, the custard becomes soft and creamy. It’s a fun little taste to mix up your feast at the night market. Where I ate it: Rahoe Night Market, Taipei. Available at all night markets. Taiwan has a really well developed coffee culture, and you can get a reliable espresso on almost every city street block! Where I drank it: The best cafe culture is in Tainan, where any given block can have multiple hip coffee spots. My recommended is Coin Coffee. Disclosure: This post contains affiliate links, which help keep Nutrition Traveller running. I personally use every brand and app I recommend on here and truly love them! Questions on what to eat in Taiwan? Drop us a comment below or say hello @nutritiontraveller. Post updated on December 2, 2018.